Two weeks ago, Meet The Press began with Massachusetts Governor Deval Patrick (D) and Ohio Governor John Kasich (R) seated side by side for a meaningful (and sometimes heated) discussion. Today, the show was back to its old trick of doing boring, sequential interviews with newsmakers, even though they were each presented as spokesmen for the two presidential candidates. 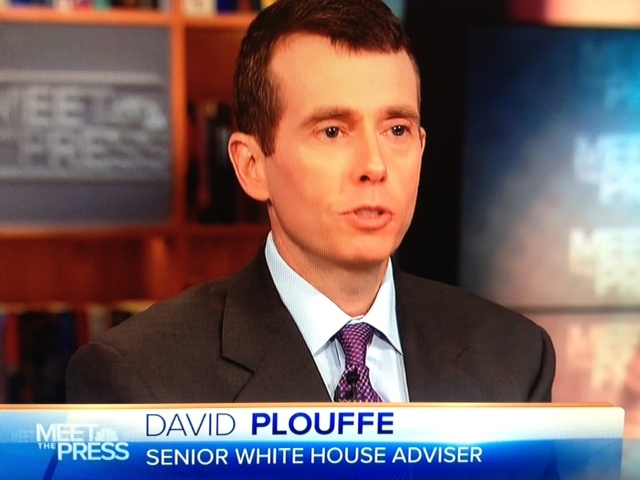 First up was Senior White House Advisor David Plouffe. He said the economy in Europe, including what happens in the Greek elections, has a big impact on the economy here. Host David Gregory tried to get Plouffe to talk about the political implications of this (asking if Greece was more important than Ohio in the president’s re-election bid) but Plouffe deflected the question. On the immigration reforms announced by the president this week, Gregory tagged it as political even before asking about the impact or impetus. Plouffe said, “It wasn’t about politics,” before explaining the moral case for the changes. Gregory noted that some say this move was an end run around Congress. Plouffe said Congress hasn’t acted on immigration, but they can anytime they like. Gregory pointed out the record number of deportations carried out in the Obama Administration. Plouffe added that deportation of criminals is up 80% under this president. On taxes, Plouffe agrees that they will go up on the highest earners if President Obama is re-elected (along with spending cuts and deficit reduction). Meanwhile the Republican plan, says Plouffe, is that if you cut taxes on the richest, the money will trickle down. “It didn’t work then, and it won’t work now,” he added. Gregory said the Obama Administration passed a lot of things aimed at fixing the economy, but they didn’t work. Plouffe countered that we are in a recovery; it is s slow, but their opponent, Governor Mitt Romney, would undo it all. Next up was Senator John McCain (R-AZ), the 2008 GOP presidential nominee. He is skeptical of the president’s immigration moves. He said it was an attempt to divert attention from the economy. Gregory tried to get McCain to blame the rightward movement of Republicans for failure to get immigration reform in recent years, but McCain did not embrace this position. McCain was critical of President Obama’s handling of the economy. Gregory played old footage of McCain attacking Romney’s government and business record during the 2008 primary campaign. McCain responded that Romney’s plan is better than Obama’s. When asked to disavow his attacks on Romney, McCain dodged. In the roundtable, Kim Strassel of the Wall Street Journal‘s editorial board said the Obama campaign seems to be trying to stitch together individual parts of the old 2008 Obama coalition – Hispanics, women, college students. Much of the debate overall was about the lack of a clear message about the future coming from the Obama campaign. Former Congressman Harold Ford, Jr. (D-TN) said he wants the Obama campaign to challenge Congress to come back and vote on the things he cares about. Time magazine’s Mark Halperin said Obama and Romney are the two “least mercurial” presidential candidates he has ever covered. Note: Happy Father’s Day to my dad and all the dads out there. I will be celebrating at Wrigley Field!